Local Realtor Paige Duff (at left of camera) poses with the production crew from Left Right LLC of New York City and two of the the local homebuyers to be featured on the show. They just wrapped up shooting two new episodes to air later this year on HGTV’s “Island Life” reality show. “Island Living” homebuyers Mike and Terrye Rabelais from Powell, Ohio, film a scene with Realtor Paige Duff at a local eatery. Left Right LLC production company films a scene with island homebuyers the Gibbses from Dayton and local Realtor Paige Duff (center). LOGAN COUNTY – Take two, Indian Lake, because it’s showtime! That’s showbiz talk for “here we go again!” And why not? Indian Lake is staking out its little corner of Hollywood and the Walk of Fame during the past year. Indian Lake is back in the national limelight. Last year the cable TV network HGTV quietly came to the popular lake in late July, secretly holed-up in a couple of rented island homes and made two episodes of its “Island Life” reality show in about 14 days. The episodes aired in late November and December of 2017, putting Indian Lake in the national spotlight. 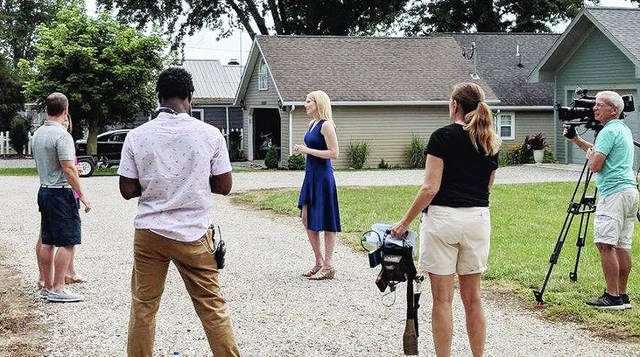 “They liked it so well, they came back again this year and filmed two more episodes,” said local Realtor Paige Duff, who starred as the real estate agent in the previous two shows. Duff received an offer from HGTV for a re-occurring role again this year and accepted. “I received an e-mail from the casting director in May who said they wanted to come back to Indian Lake to cut two more episodes and asked me if I would like be in them again. I, of course, said yes. I actually missed doing it, quite frankly. Although it’s a lot of hard work and long days it’s really a whole lot of fun,” said Duff. “I am elated that HGTV wants to see more of Indian Lake! This is such a beautiful and unique area. I’m honored to show it off on a national level,” the budding reality star added. Duff is a “Presidents Sales Club” Realtor from Indian Lake. She works for Choice Properties, which is owned by Teri Frymyer. Duff and her husband Ross have two daughters Annabelle, a 3 year-old, and Taylor, who is 7 years old. Her husband Ross is the manager of the Duff Quarry located in Huntsville. This year’s two new episodes took only 11 days to shoot and they wrapped up filming just a few weeks ago in late July. “It’s neat to be “behind the scenes” and watch how the show comes together. It takes four days to film one 21-minute episode,” said Duff. Two new area couples looking to buy island homes at Indian Lake were featured in this year’s filming of two episodes. “Island Life” is about everyday house hunters looking to find their own little affordable corner of paradise on a beautiful island – to get away from it all. The first couple, Mike and Terrye Rabalais from Powell, Ohio were looking to buy an island home in the $400,000-$500,000 range. Both are retired and they have four grown children. They are looking for a home on the lake and like the open-water views. Their island house hunting adventures will be featured in the first episode to air later this year. The second couple, Chris and Tina Gibbs from the Dayton area, are shopping for an island vacation home in the $500,000 to $600,000 range. The Gibbs have a blended family that includes 6 children and they wanted a place to have fun with the whole family on the water. The homes filmed were located in various spots around the lake and the Indian Isles, including the gated community of Longview Cove on the northeast side of Indian Lake, Duff explained. The couples were filmed looking at potential homes to buy with Duff as the real estate agent showing the houses. Each couple was also filmed doing fun things around the lake such as jet skiing, going to the beach and enjoying the many fine eateries and tourist attractions around the lake. “Sometimes the weather doesn’t always cooperate with the shooting of a scene and these production crews are on a tight schedule,” added Duff. “One day we headed out on the lake to shoot a wakeboarding scene with the Gibbs, but it rained heavily so the crew had a back up plan. We filmed at the doughnut shop, ice-cream parlor and the Neil Armstrong Air and Space Center instead. “I appreciate all of the area businesses who agreed to let us film at their locations. It’s fun to see those familiar places on TV,” said Duff. Businesses included in filming this year were: Mimi’s, Cranberry, Paradune (new brewery on islands), Hurley’s Farm Market, Donut Shop, City Sweets and Creamery (Bellefontaine) and Armstrong Air & Space Center (Wapakoneta). Although the same production company shot the episodes, it was a completely different crew this time around that came to film. The crew consisted of two cameramen, two producers and several assistants. They stayed in the same homes on the lake where the previous production crew stayed last year. Filming averaged 12 hours a day and four days total for each episode. Although HGTV has not released a date that the two new episodes will be aired, it is expected to be around the first of the year or shortly thereafter. Last year there was such a buzz around town about a reality show being made at Indian Lake that two large community viewing parties were organized to watch the episodes when they air on national TV. Expect the same this year. Stay tuned, because, in “reality,” the fun is just beginning here at Indian Lake. https://www.urbanacitizen.com/wp-content/uploads/sites/36/2018/08/web1_Duff.jpgLocal Realtor Paige Duff (at left of camera) poses with the production crew from Left Right LLC of New York City and two of the the local homebuyers to be featured on the show. They just wrapped up shooting two new episodes to air later this year on HGTV’s “Island Life” reality show. 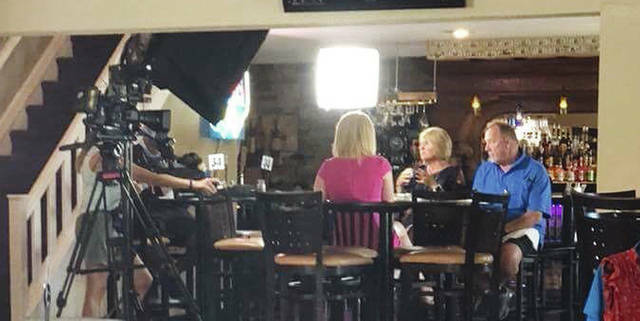 https://www.urbanacitizen.com/wp-content/uploads/sites/36/2018/08/web1_Duff3.jpg“Island Living” homebuyers Mike and Terrye Rabelais from Powell, Ohio, film a scene with Realtor Paige Duff at a local eatery. 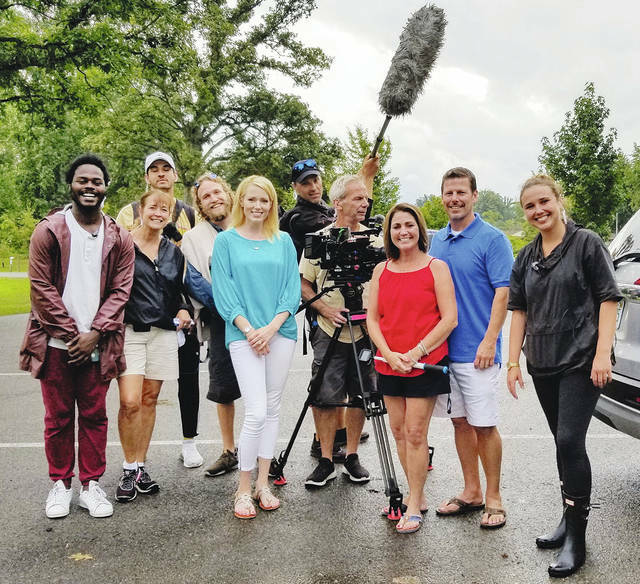 https://www.urbanacitizen.com/wp-content/uploads/sites/36/2018/08/web1_Duff2.jpgLeft Right LLC production company films a scene with island homebuyers the Gibbses from Dayton and local Realtor Paige Duff (center).